LightWave 3D ScreamerNet LWSN may be used for background rendering with LWSN in standalone mode (-3) to render single scenes independent of LightWave itself. This Background Rendering with LightWave 3D ScreamerNet LWSN step by step tutorial will show you how to render a scene in the background while you continue to work on another scene in LightWave Layout, which is especially useful on multi core/processor computers with extra power to spare. It may also be used to render a scene on another computer other than the one you are working on, as long as you can access the LightWave with your config files, programs and content over your network via file sharing, or just copy all the files to the other computer for rendering. The following step-by-step Background Rendering with LightWave 3D ScreamerNet LWSN tutorial shows how to render DLI_SuperBalls, the sample scene that is included with the FREE Lite version of DreamLight Constellation & DLI_SNUB-Launcher, using LightWave 3D ScreamerNet LWSN in standalone mode (-3) on Mac OS X or Windows. 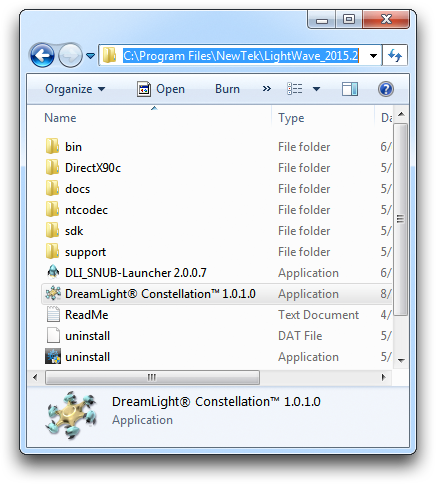 Download the DreamLight Constellation bundle which includes the FREE LITE versions of DreamLight Constellation, DLI_SNUB-Launcher and DLI_SuperBalls pre-built sample content folder. 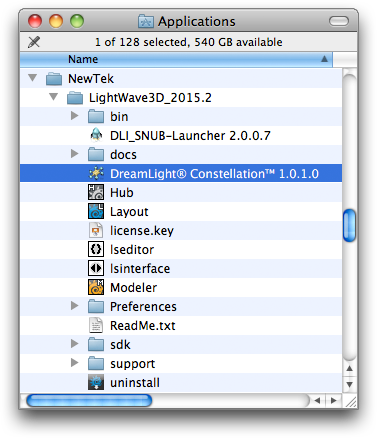 Drag the DreamLight Constellation application & DLI_SNUB-Launcher application files from the unzipped folder to your LightWave 3D applications folder where Layout and Modeler are found: /Applications/NewTek/LightWave3D_2015.2 on Mac OS X or C:\Program Files\NewTek\LightWave_2015.2 on Windows. Enter an administrator’s username and password if prompted. You may then create an alias/shortcut to place on your desktop or elsewhere if desired. While DreamLight Constellation & DLI_SNUB-Launcher can actually be run from anywhere, they will automatically locate the default settings from LightWave Layout’s config file more easily when run from the LightWave3D folder. Drag the prebuilt sample Content Folder, the DLI_SuperBalls folder, into your user’s Documents folder which will be used in the following tutorials. There are a few settings that are stored in the LightWave 3D Layout config file that are used by ScreamerNet LWSN for standalone mode -3 rendering. The first is the Content Directory which ScreamerNet LWSN will read from the config file if not overridden in the command line or by drag and drop in DLI_SNUB-Launcher at the time of rendering. The other two are the Segment Memory Limit and the Multithreading settings. The defaults for these are, Segment Memory Limit: 1024 MB and Multithreading: Automatic. Those defaults are usually fine so changes to those two are optional. 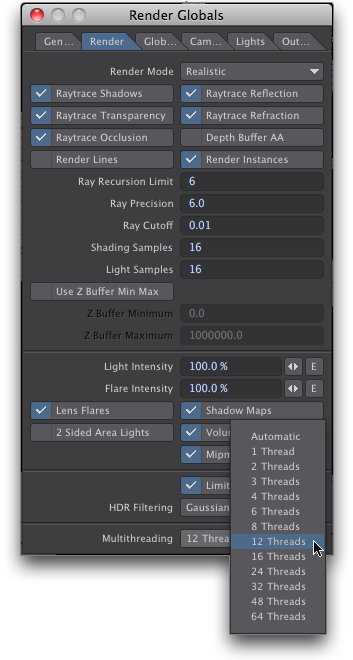 For more information see Managing LightWave 3D ScreamerNet LWSN Config Files. Set the Content Directory with Edit->Set Content Directory… Navigate to and select: Documents/DLI_SuperBalls/ Or you may simply load any of the DLI_SuperBalls scenes and answer Yes when asked if you’d like to change the Content Directory to the detected Content Directory. This assumes you have already placed the DLI_SuperBalls folder in your user’s Documents folder. See Content Directory for more information. OPTIONAL: Open Render->Options->Render Globals and set the Segment Memory Limit to at least 32 MB or leave it set to the default of 1024 MB. See Default Segment Memory for more information. Click yes when asked if this should be the new default setting, or it won’t be saved in the config file. OPTIONAL: Click the Render tab and set Multithreading to the number of cores/threads that you would like to use up to the maximum number of threads on your computer. This can be useful if you want to reserve some horsepower so that you can perform other work on the same computer while it’s rendering in the background. Or simply leave it set to the default of Automatic to have it use the maximum available threads. See Multithreading for more information. Quit LightWave to save the config file to disk. The RGB output render destination is stored as an absolute path in the scene file, even if the destination is inside the Content Directory, therefore you need to set the RGB output render destination any time you move a scene to a new computer. If you use DLI_SNUB-Launcher which can override the scene settings when the scene is opened for rendering, you can skip this section and go right to Drag-and-drop Rendering with DLI_SNUB-Launcher. If you are using the stock LWSN manually you must first set the RGB output render destination in LightWave Layout and resave the scene file before rendering it as follows. from the current user’s Documents folder. Click Yes if asked if you’d like to change the Content Directory when loading the scene. Click the RGB Files button. Verify that DLI_SuperBalls-Anim is set in the Save As: field. 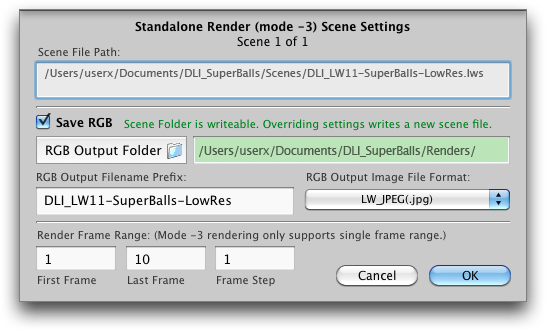 Navigate to the DLI_SuperBalls/Renders/ folder. Click the Save button to dismiss the dialog and accept the changes. Rather than typing ScreamerNet LWSN command lines manually by hand, you may use our drag-and-drop GUI utility, DreamLight SNUB-Launcher, to interactively build the command lines and launch ScreamerNet LWSN with a Mac friendly drag-and-drop-dead-easy™ interface, even on Windows. 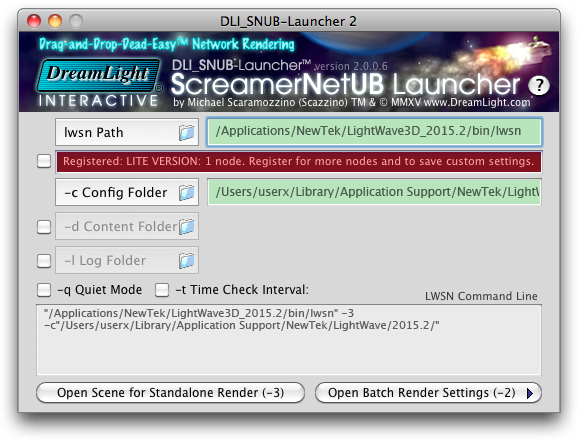 Move the DLI_SNUB-Launcher 2 application into your LightWave3D folder if not already there, as outlined above. 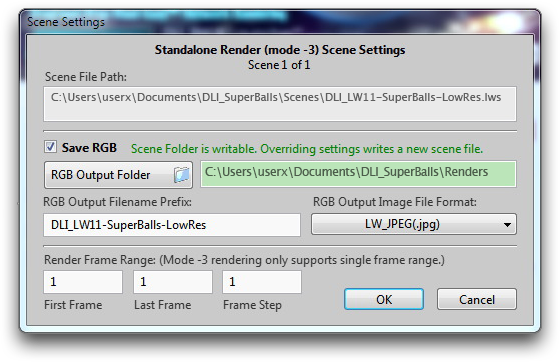 Drag the DLI_SuperBalls-LowRes.lws scene and drop it onto the Open Scene for Standalone Render (-3) button or onto the DLI_SNUB-Launcher 2 icon on the desktop or the Dock/Taskbar to open the Scene Settings Panel. 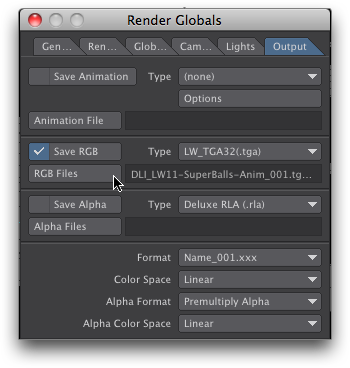 Then check and/or set the RGB Output Folder to the folder where you’d like to save the renders by clicking the button or dragging a folder to the button or field. Set the RGB Output Filename Prefix field to what you’d like to name the render files. Select an RGB Output Image File Format for the rendered image files. 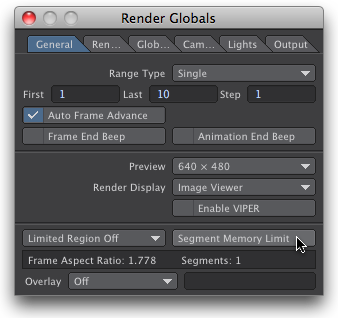 Set the desired Render Range, and click OK to render the scene. Click OK if it asks you to change the Content Folder. Another way to configure and launch ScreamerNet LWSN is to manually type the command line to launch it in Terminal/Command. 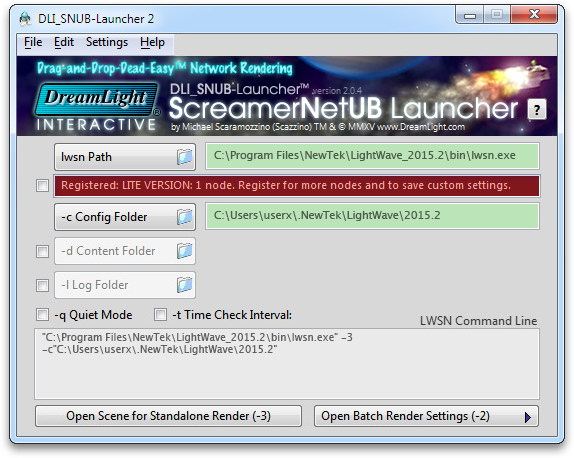 For a much easier and far less error prone method to configure and launch ScreamerNet LWSN, just use the previous interactive method – Drag-and-drop Rendering using the FREE Lite Version of DreamLight SNUB-Launcher as a Droplet. For an in-depth discussion and explanation of each of LightWave’s available command line parameters, please review LightWave 3D ScreamerNet LWSN Command Line Parameters. Launch /Applications/Utilities/Terminal on Mac OS X or Start->Command Prompt on Windows. Type or paste the following into the command line, all on one iine, substituting your actual username. Then press the return key. ScreamerNet lwsn will then render frames 1-10 and place them in the RGB output folder you’ve set in the scene.